The way I see it, since the Tampa Bay Rays were a 200-1 shot to win the World Series before the season started, there are at least 200 people out there who should be getting in line at Tropicana Field and admitting defeat. Last nights win against the defending champion Boston Red Sox means that our team of once underdogs is now taking their rightful place in the World Series as one of the best in the league. In case you missed it, here’s a quick recap of game 7. The Rays gave up one home run to Red Sox Dustin Pedroia in the first-inning, and that’s the end of my bad news. MVP Matt Garza pulled through with 118 pitches gave us the strong lead when he struck out nine and walked three players. Evan Longoria and Rocco Baldelli drove in runs during the fourth- and fifth-innings. In the seventh-inning, Willy Aybar put the icing on the cake with a home run. 2007 first-round draft pick rookie David Price finished off the game by forcing Red Sox Jed Lowrie to ground into a force play where Rays second baseman, Akinori Iwamura, made the final out. You can’t even script this stuff! The game ended with a team pile-up, a champagne shower for fans sitting near the front on right field and the presentation of the American League championship trophy. So welcome to Tampa Bay, Phillies. 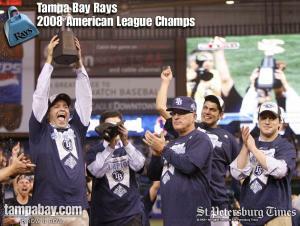 We’ve got our cowbells ready and the Rays are good to go. Just remember, it’s not spring training anymore. Phillies Phans if you are looking for info about the area to plan and book your trip then click here.